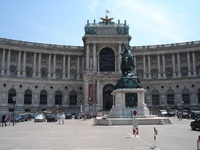 Well, I got up nice and early today to go to the Austrian National Library. Finding the right entrance at the Hofburg was a chore, but I finally figured out the main one is right under the famous terrace where Hitler annexed Austria in 1938. I paid ’Ç¨1.50 to enter, and headed to the OPAC computers. That’s where the trouble began. I couldn’t find anything useful. I’d put in keywords such as “Austria” and “Industry” and get no results. I gave up on the computers and decided to walk around a bit and take a look at the three books I found on the computers from which I could perhaps at least get a quote out of. I then realized all the signs just showed “reading lounges” but no directions to certain call numbers. There was also a desk called “book hand out,” which leads me to believe that you have tell them what books you want and then they go and get them. I went back to the OPAC computers and checked if I could find any kind of instructions on using the library, but all I found was a link to a listing of classes on using the library. I gave up.